MANHATTAN — The average studio rental in Manhattan cost $2,691 a month in March, according to a report released Thursday by Douglas Elliman. Since most landlords require a yearly salary that's roughly 40 times the monthly rent, that means a tenant in the average Manhattan studio would need to earn about $107,640 a year. Guarantors who co-sign leases — usually family members — are often required to make 80 times the monthly rent, which would be $215,280 a year. Studio prices have been growing at a faster rate over the past six months than larger-sized apartments in Manhattan and trendy parts of Brooklyn and Queens, Jonathan Miller, author of the Elliman report, said. The main drivers include strong job growth along with tight credit and high sales prices — both of which create barriers to entering the purchase market, Miller explained. "You have an improving economy and rising employment that is creating more strength at the low end of the market," Miller said. "Tight credit disrupts the organic flow of renters to becoming first-time buyers [and with] rising prices at the entry level in the purchase market, affordability is challenged. So you create this logjam for smaller apartments that causes rents to rise." Manhattan studio prices jumped 8.6 percent in 2014 compared to the year before, according to the Elliman report. In Brownstone and North Brooklyn, where studios averaged $2,291 a month, prices were up 3.1 percent and in northwest Queens, which includes Long Island City, studios averaged $2,281 a month, up 9 percent from the year before. 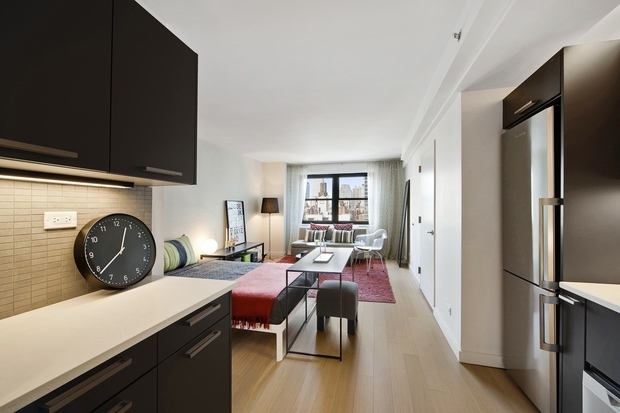 There are, of course, studios — even in Manhattan — for under $2,000 a month, Citi Habitats Gary Malin said. Studios averaged $1,359 a month in Washington Heights, $1,401 in Harlem and $1,924 on the Upper East Side, according to a Citi Habitats report looking at the first quarter. Luciane Serifovic of Douglas Elliman recalled that when she started in the real estate industry a dozen years ago, "back then, a lot of students wanted to live in studios. Now, it's young professionals." She's noticed that many of these renters actually earn a little bit more than 40 times the rent because "they want to save to buy." Nearly 30 percent of New York City households earn more than $100,000 a year, according to an analysis of 2013 Census data from the Fiscal Policy Institute. Serifovic doesn't expect studio rents to drop as the busy spring and summer rental seasons heat up. Although the Elliman report found that Manhattan vacancy rates jumped this March to 2.38 percent from last year's 1.68 percent, she believes that landlords will use this in their favor since they can charge more rent in the warmer months. "I always tell clients there's less competition and lower prices in the winter," Serifovic said. "But a lot of people don't want to go through the process of moving in the winter months."